The perfect gift for the health-conscious chef from the bestselling authors of The Starch Solution and The Healthiest Diet on the Planet. Food is our most powerful medicine. And with this revolutionary program, the fat-free way to healthier eating has never been easier—or more delicious. Thanks to John and Mary McDougall, countless health-conscious Americans have learned that our standard meat-heavy diet is hazardous to our health—and that the low-fat solution doesn't have to be low on taste. This collection of three hundred vegan, high-carbohydrate, virtually fat-free recipes offers a well-balanced, mouthwatering mix of fresh fruits, vegetables, legumes, and grains to help you lose weight, reverse illness, and do right by the environment. Inspired by dishes from around the world, the recipes use familiar ingredients and rely on simple and consistent preparation methods. · An updated “McDougall-Okayed Packaged and Canned Products” list to help you shop with confidence. Great addition to your cookbook collection. It's a revolutionary way of thinking. Carbs are not the enemy as long as they're the right kind. Carbs that come from the ground are the healthiest kind. Potatoes, corn, this book outlines the healthiest plant-based eating plan you could imagine. Dr. McDougall has proven that this way of life is successful for weight loss and enhances overall well-being. If you're not interested in losing weight but eat strictly vegan, this is the cookbook for you. 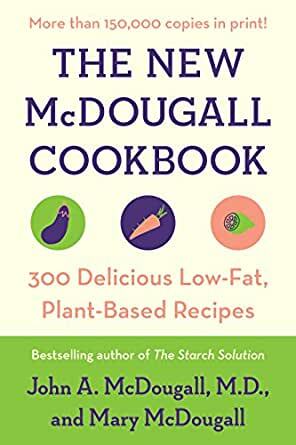 The McDougall diet is essentially a vegan diet that places an emphasis on grains and pastas, wheat, oats, and rice, supplemented with vegetables and fruit. No meat. No poultry. No fish. No dairy products, no cheese, no eggs. No salt, no sugar. So, Mary McDougall took on the challenge of creating tasting recipes from a limited number of ingredients. Many of her recipes turn out to be very tasty, because she likes to pep them up with onions, garlic, peppers and lots and lots of spices. To get started with these recipes, it is very helpful to stock up on the ten or fifteen spices she uses most. Some recipes, especially those that start with dried beans, require a great deal of cooking time. A solution is to cook large quantities of those foods on Saturday, put them in five or six small containers, and then refrigerate or freeze them. When you come home from work, just pop a container into the microwave while you make a tossed salad. There are many good vegetarian and vegan cookbooks. This is a good one for people who are new to vegetarian cooking and who have limited cooking experience. Although many of the recipes require time and effort, most are relatively easy and even an inexperienced cook can create tasty results. This is my favorite cookbook! I love all McDougall's recipes because they are easy and use "normal" ingredients. I originally bought it at a used book store, but since have ordered many more for my friends. All the recipes are so good, I never feel deprived. I eat until I'm full. I've been cooking this way for 6 years and lost weight, but no longer worry about gaining it back. I am so thankful for John McDougall! PS: His website has so many inspirational success stories that are also so inspiring. This is a great book, the recipes are simple yet very tasty. Would recommend it to all.